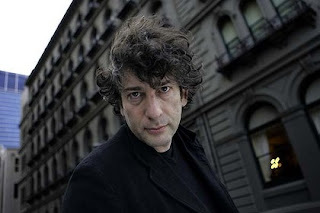 Whenever I am asked to list my favorite authors, Neil Gaiman almost always is the first name out of my mouth. I don't care what you say about him, Neil is one of the best fantasy writers I've ever come across and his imagination is unfathomably immense. He has more talent in one eyelash than I do in my entire body. He's also kind, hilariously funny and incredibly smart. He's also scary as all Hell. Books don't scare me, but I've been kept up at night by some of Neil's more horrific tales. It's fitting that Neil "Scary Trousers" Gaiman has invented a scary book holiday just for Halloween. It's even more fitting that he's contributed his own uniquely brilliant and shockingly scary story of his own. Let's first begin with All Hallow's Read. It's Neil Gaiman's very own holiday and it's awesome. The entire point of it is reading and celebrating scary books. Give scary books as presents to friends, family and your enemies. I'm partial to the dense but horrifying tales of HP Lovecraft and Edgar Allan Poe. The point is getting people to read and engaging them in books. Not such a bad reason for a holiday, huh? 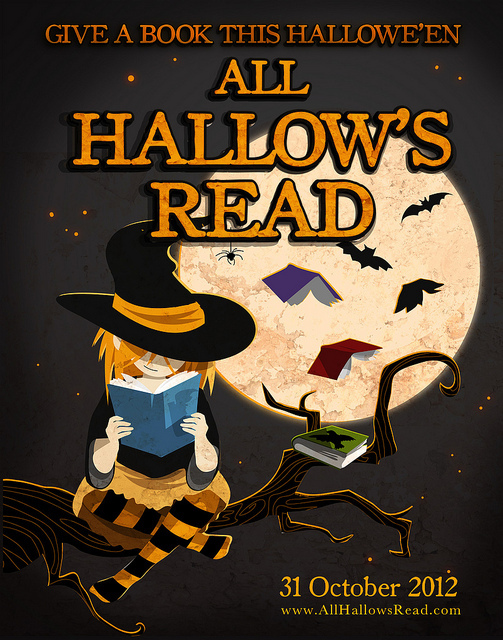 The All Hallow's Read website is chocked full of goodies as well, from scary book recommendations to scary bookmarks you can print and hand out. They even have a very awesome printable "mini-book" of Poe's The Raven, a scary book classic. Participation is as easy as giving someone you care about a book that will scare the pants off them. All holidays should involve giving books. Neil has given us a scary gift for this Halloween as well. 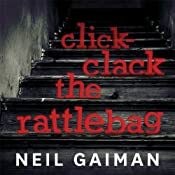 Teaming up with audible.com, Neil has released an unpublished scary audio short story that is absolutely hair-raising. It's called "Click-Clack the Rattlebag" and it's really damn scary. It's twelve minutes long and read in Neil's fabulous voice. It's available for free until Halloween, when it's removed forever. It is, no lie, legitimately scary and unnerving. What's better than a free short story read by Neil Gaiman? A free short story read by Neil Gaiman that also helps charity! For each download of the story, audible.com will donate money to DonorsChoose.org, an education charity. Move over Great Pumpkin, this is the best Halloween ever! Get your scary story fix while you can, and remember to give a scary book to someone this holiday!